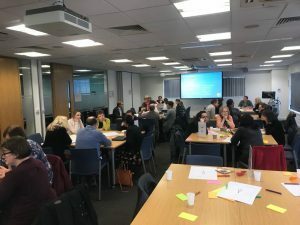 The Ageing, Frailty and Dementia Steamlab took place at BU on 14 February, co-hosted by the Ageing and Dementia Research Centre (ADRC) and Bournemouth University Clinical Research Unit (BUCRU). The Steamlab brought together academics and clinicians from across the county with an interest in the topic area. The event kicked off with an introduction by the Directors of the host research centres: Professor Jane Murphy, ADRC; Professor Jan Wiener, ADRC; and Professor Peter Thomas, BUCRU. Attendees were then given some time to individually reflect on their own skills, knowledge and experiences, and asked to identify current key challenges in the field. Guest speaker Esther Clift from Southern Health gave an interesting talk about her experiences of frailty based on her practice as an Occupational Therapist and the importance of what she believes is the first community-based Multidisciplinary Frailty Team in the UK, which is based in in the New Forest. After lunch, attendees heard from guest speakers: Professor Peter Thomas from BUCRU about how BU can support practitioners undertaking clinical research with an overview of the staff and services that BUCRU provide; and Dr Mike Vassallo from Royal Bournemouth and Christchurch Hospital about his personal experiences of undertaking research as a practitioner and the value that this has had on his clinical practice. Attendees then teamed up to develop a research project idea based on one of the areas identified as a key challenge from the morning session. Teams then had 5 mins to each feedback their ideas to the group. Attendees voted for the project they felt was the strongest. The winning team, with representatives from BU and Poole NHS Hospital Trust, have been given the chance to submit a proposal for some pump prime funds to kick start work on a new project to inform a larger research bid! 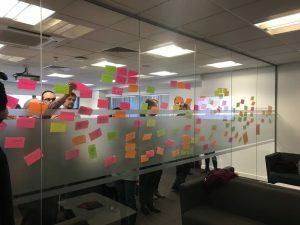 With over 30 people attending, the Steamlab was lively and lead to some interesting discussion and debate about the key challenges we face as an ageing society. The opportunity to think about and discuss challenges through the integration of research and practice was particularly useful. For more information about the ADRC or BUCRU.